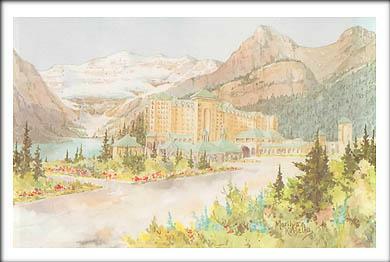 Today's Chateau Lake Louise on the shore of beautiful Lake Louise has evolved through many stages. One of several Canadian Pacific Hotels built upon completion of the railway in 1885, it first opened as a Chalet style hotel in 1890. Falling victim to tire soon after, it was rebuilt in a Tudor style. Unfortunately, the new building was not considered attractive. (''It was a hotel to be looked from rather than a hotel to be looked at.'' -- Quote by Jon Whyte) In 1984 the hotel was given a new facade more befitting to its striking setting, and in 1987 a new wing was added. The hotel's present day grandness is the ultimate in comfort and esthetics. Visitors are awed by the stunning view of the beautiful blue/turquoise lake, lush floral gardens and the surrounding peaks of Mount Lefroy, Victoria, Whyte, The Beehive and Niblock.